A Late 15th Century Style Oak Trestle Dining Table, handmade (click this link to appreciate what goes into our handmade furniture) from old reclaimed oak. 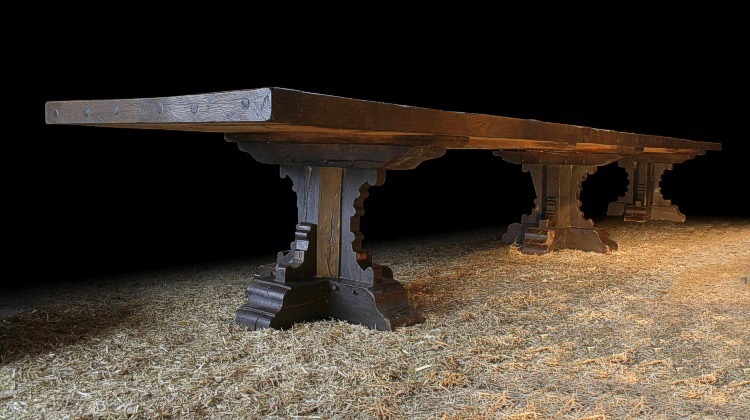 Based on a pair of tables in the Great Hall at Penshurst Place, Kent, this example is almost 20ft long with a 3 inch thick top and will seat 18 people comfortably. Made for our clients castle in Ireland and the result of hundreds of hours work, both in making and finishing. 34 components all cut with hand held tools, hand planed and individually fitted using pegged joints.